Remove the rocker cover. Refer to EM-37, "Removal and Installation". Remove camshaft position sensor bracket. Remove the valve timing control cover. Refer to EM-75, "Valve Timing Control Cover". Rotate crankshaft pulley clockwise, and align mating mark for TDC (B) with timing indicator (A) on front cover, as shown. NOTE: Do not use the white paint mark (C). 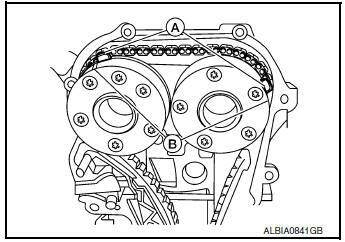 At the same time, make sure that the mating marks (outer groove) (B) on camshaft sprockets are lined up with the pink links (A) in the timing chain, as shown. 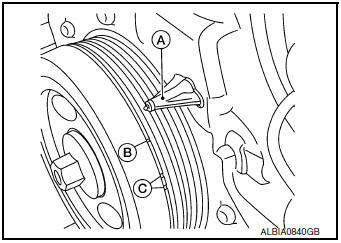 If not, rotate crankshaft pulley one more turn to line up the mating marks (outer groove) (B) to the pink links (A), as shown. Remove the timing chain from camshaft sprocket (INT) and camshaft sprocket (EXH). Use suitable tool to prevent timing chain from falling into front cover after it has been removed from camshaft sprocket (INT) and camshaft sprocket (EXH). Do not rotate the crankshaft or camshafts while the timing chain is removed. It can cause damage to the valves and pistons. Secure hexagonal part of the camshaft with a suitable tool and loosen the camshaft sprocket bolt. 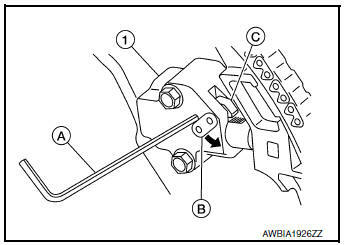 Loosen the camshaft bracket bolts in the order as shown, and remove the camshaft brackets and camshafts. NOTE: Remove camshaft bracket (No. 1) by slightly tapping it with a rubber mallet. NOTE: Check installation positions, and set them aside in the order removed. Put the camshaft on a V-block supporting the No.2 and No.5 journals. CAUTION: Do not support the No. 1 journal (on the side of the camshaft sprocket) because it has different diameter from the other four locations. Set suitable tool (A) vertically on the No.3 journal. 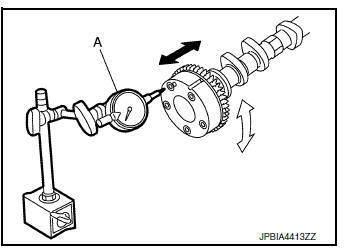 Turn camshaft in one direction by hand, and measure the camshaft runout on the dial gauge total indicator reading. 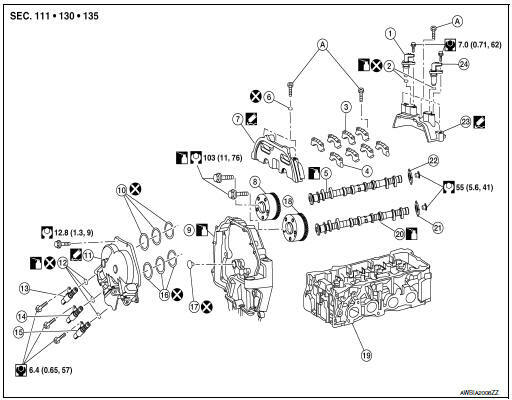 Standard : Refer to EM-116, "Camshaft"
Standard intake cam height : Refer to EM-116, "Camshaft"
Standard exhaust cam height : Refer to EM-116, "Camshaft"
If wear is beyond the limit, replace the camshaft. Measure the outer diameter of the camshaft journal using suitable tool (A). 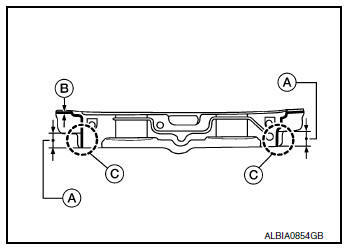 Standard No.1 outer diameter : Refer to EM-116, "Camshaft"
Standard No.2, 3, 4, 5, outer diameter : Refer to EM-116, "Camshaft"
Tighten the camshaft bracket bolts to the specified torque following the tightening pattern as shown. Using suitable tool (A), measure inner diameter of camshaft bracket (1). Standard No.1 : Refer to EM-116, "Camshaft"
Standard No.2, 3, 4, 5 : Refer to EM-116, "Camshaft"
When out of the specified range above, replace either or both the camshaft and the cylinder head assembly. 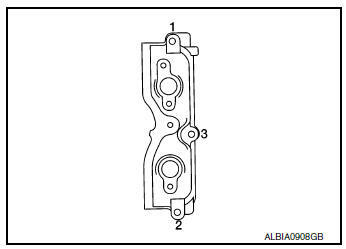 NOTE: Inner diameter of the camshaft bracket is manufactured together with the cylinder head. 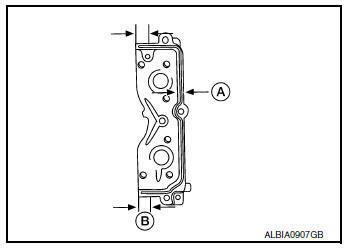 If the camshaft bracket is out of specification, replace the whole cylinder head assembly. Install suitable tool (A) in the thrust direction on the front end of the camshaft. Measure the end play with the dial gauge while moving the camshaft forward and backward (in direction to axis). 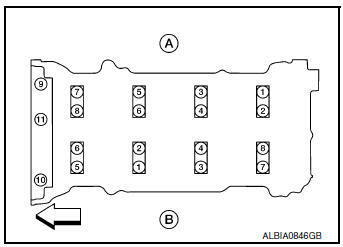 Standard end play : Refer to EM-116, "Camshaft"
Install the camshaft in the cylinder head. Install the camshaft sprocket on the camshaft. Measure camshaft sprocket runout while turning the camshaft by hand using suitable tool (A). Runout : Refer to EM-116, "Camshaft"
If it exceeds the specification, replace camshaft sprocket. Check if the surface of the valve lifter has any excessive wear or cracks, replace as necessary. Measure the outer diameter of the valve lifter using suitable tool (A). Valve lifter outer diameter : Refer to EM-116, "Camshaft"
If out of the specified range, replace the valve lifter. Measure diameter of valve lifter bore of cylinder head using suitable tool (A). 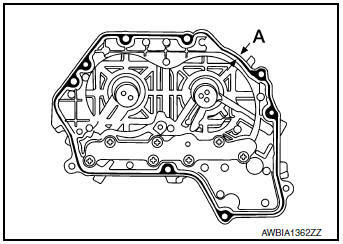 If out of the specified range, replace the cylinder head assembly. 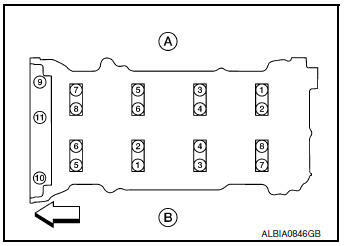 If out of specified range, replace either or both valve lifter and cylinder head assembly. Install them in the same position from which they were removed. NOTE: The distinction between the intake and exhaust camshafts is the difference in the shape of the rear. Install camshafts so that the dowel pins (A) on the front side are positioned as shown. Install by referring to identification mark on upper surface mark. Install so that identification mark can be correctly read when viewed from the exhaust side. Install camshaft bracket (No. 1) as follows. Apply liquid gasket to camshaft bracket (No. 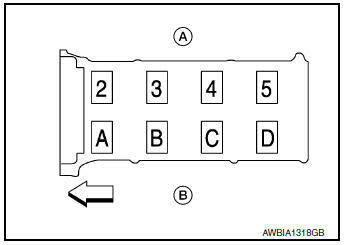 1) as shown (A), (B). Refer to EM-5, "Liquid Gasket". Apply liquid gasket to camshaft bracket (No. 1) contact surface on the front cover backside. Refer to EM-5, "Liquid Gasket"
Apply liquid gasket to the outside of bolt hole on front cover. 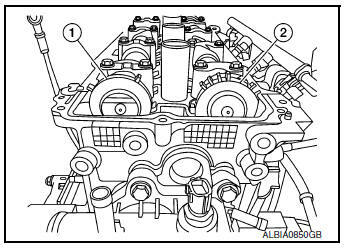 Refer to EM-5, "Liquid Gasket"
Position the camshaft bracket (No. 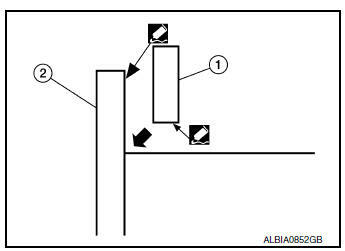 1) near the installation position, and install it without disturbing the liquid gasket applied to the surfaces. 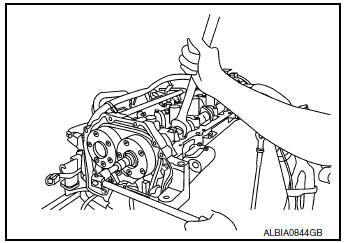 Tighten camshaft bracket bolts in four steps in the order as shown. CAUTION: After tightening camshaft bracket bolts, be sure to wipe off excessive liquid gasket from the parts listed below. Mating surface of rocker cover. Mating surface of front cover, when installed without the front cover. 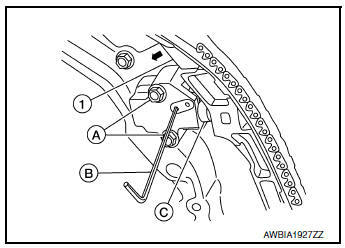 Install them by lining up the mating marks (outer groove) (B) on each camshaft sprocket with the painted marks (A) on the timing chain during removal. 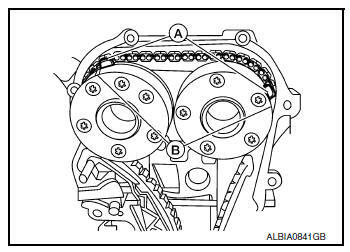 Before installation of chain tensioner, it is possible to re-match the painted marks (A) on timing chain with the mating marks (B) on each sprocket. Install timing chain tension guide. 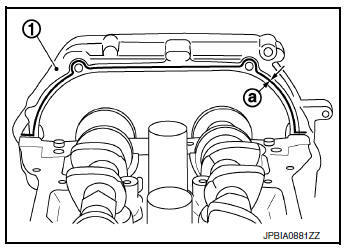 Install intake valve timing control cover with the following procedure. 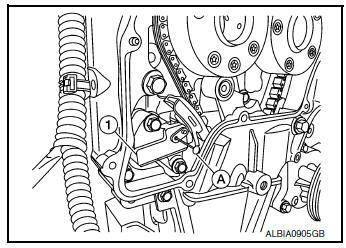 Install intake valve timing intermediate lock control solenoid valve, intake valve timing control solenoid valve, and exhaust valve timing control solenoid valve to valve timing control cover. Check and adjust valve clearances. Refer to EM-19, "Camshaft valve clearance". Install camshaft position sensor bracket. 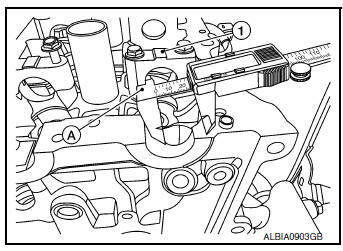 Apply liquid gasket to camshaft position sensor bracket as shown. 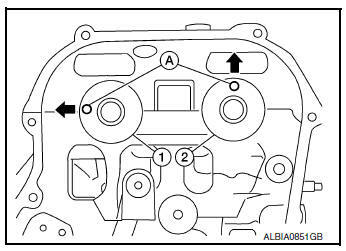 After installation be sure to wipe off excessive liquid gasket leaking from part (B). Tighten bolts to specification in numerical order shown. Install the camshaft position sensors. Refer to EM-64, "Exploded View". WARNING: Check when engine is cold so as to prevent burns from any splashing engine oil. CAUTION: Perform this inspection only when DTC P0011, P0014, P052A, P052B is detected in self-diagnostic results of CONSULT and it is directed according to inspection procedure of EC section. Check engine oil level and adjust oil level as necessary. Refer to LU-7, "Inspection". 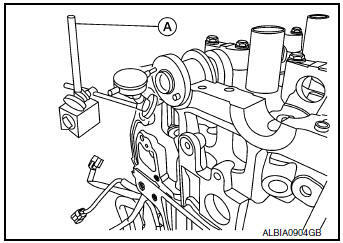 Remove the intake valve timing intermediate lock control solenoid valve, intake valve timing control solenoid valve, and exhaust valve timing control solenoid valve. Refer to EM-74, "Intake Valve Timing Intermediate Lock Control Solenoid Valve, Intake Valve Timing Control Solenoid Valve, and Exhaust Valve Timing Control Solenoid Valve". 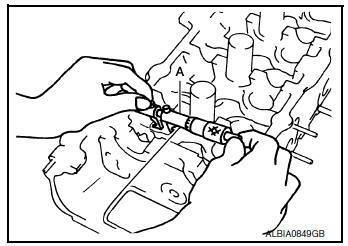 Perform the following procedure to prevent the engine from being unintentionally started while checking. Release fuel pressure. Refer to EC-144, "Work Procedure". Crank engine, and then make sure that engine oil comes out of the valve timing control cover oil holes (A). End cranking after checking. WARNING: Be careful not to touch rotating parts (drive belt, crankshaft pulley, etc.). Engine oil may squirt from intake valve timing intermediate lock control solenoid valve, intake valve timing control solenoid valve, exhaust valve timing control solenoid valve installation holes during cranking. Use a shop cloth to prevent engine oil from splashing on worker, engine components and vehicle. Do not allow engine oil to get on rubber components such as drive belts or engine mount insulators. Immediately wipe off any splashed engine oil. 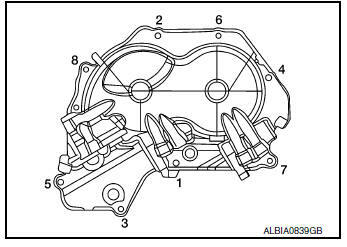 If engine oil does not come out from valve timing control cover oil holes (A), diagnose problem in lubrication circuit such as dirty oil groove between oil strainer and intake valve timing intermediate lock control solenoid valve, intake valve timing control solenoid valve, or exhaust valve timing control solenoid valve. Refer to LU-5, "Engine Lubrication System". Remove components between intake valve timing intermediate lock control solenoid valve, intake valve timing control solenoid valve, exhaust valve timing control solenoid valve and camshaft sprocket (INT) or camshaft sprocket (EXH), (if necessary) and then check each oil groove for clogging. Clean oil groove if necessary. Refer to LU-5, "Engine Lubrication System".